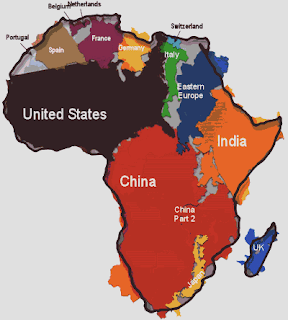 Africa is HUGE!!! Check out this map . . . Westerners have no concept of the size of this continent. When I was a kid, we didn't learn much about Africa in school. But I do remember that Tanzania was once Tanganyika and Zimbabwe was Rhodesia and South Africa was divided by apartheid and that the British ruled much of the continent, along with Portugal, France, Italy and Germany. We also knew about the slave trade and other nefarious doings. So I guess we knew more than I thought. But there is still much to learn. Africa is a gorgeous, diverse, interesting continent with intelligent, beautiful people who love their families just as we do. The West doesn't have a corner on life. Another thing we don't realize is that Africa is a continent. It's not a country with states, such as the US with its states or Canada with its provinces or the EU with its countries. Kenyans are Kenyans; they tell me they are not Africans! (Just like I tell people, no, we are not Americans -- we are Canadians). Wow! That map really puts things into perspective!